Stomatological Dis Sci 2018;2:5.10.20517/2573-0002.2018.01© The Author(s) 2018. 1Faculty of Oral and Dental Medicine, Misr International University, Cairo 11828, Egypt. 2Faculty of Dentistry, Cairo University, Cairo 11651, Egypt. Cosmetic dentistry is becoming one of the leading concerns for most of our patients. Whiter teeth are believed to be associated with health or beauty. Patients are demanding a "perfect smile". Tooth discoloration has different etiologies; this can be due to internal discoloration or external discoloration, or a combination of both. Tooth discoloration can be treated by different treatment approaches starting from the least invasive method; such as whitening tooth paste, professional cleaning (scaling and polishing) to remove surface stains and internal bleaching of non-vital teeth. More aggressive methods include external bleaching of vital teeth, micro abrasion of enamel with abrasives and acids, macro-abrasives, and crowns or veneers[2,3]. Bleaching is one of the least aggressive modalities that has gained popularity. The mechanism of bleaching with hydrogen peroxide works by the breakdown of hydrogen peroxide (H2O2) molecules into hydroxyl free radicals. These free radicals attack the organic molecules in the teeth and break the carbon double bonds into single bonds which ends up with teeth lighter in color. Tooth bleaching can be done either in-office or at-home or a combined method between in-office and at-home bleaching. Some authors suggested that[5-7] at-home bleaching is more cost-effective, commonly used, and provides better color stability. Some authors stated that in-office technique gave better results and owing to its short application time made it more requested by the patients. In an attempt to overcome the drawbacks of in-office bleaching technique and the long exposure time of at-home technique, the combined bleaching technique emerged. This combined technique was said to give better and more durable results in whitening teeth[8,9]. Also, according to Deliperi et al. and Matis et al., it gives less exposure time to bleaching materials decreasing the susceptibility to hypersensitivity as a side effect as with the in-office bleaching technique. Dentin hypersensitivity is considered a common side effect of in-office bleaching, which may lead to termination of treatment, caused by either increased concentration of bleaching agent or exposure time. Thus many attempts have evolved to decrease susceptibility to postoperative hypersensitivity. Thus, the efficiency in terms of color change, color stability and safety in terms of tooth sensitivity had to be studied. Therefore, a randomized controlled clinical trial was done to assess which technique gives better results with minimal side effects. The hypothesis was the combination of both in-office and at-home bleaching treatments give better bleaching results and with less postoperative hypersensitivity than an at-home or in-office treatments alone. In the current study, two bleaching systems were used. The name of bleaching kits, description, composition, and manufacturer are listed in Table 1. ZOOM! 25% hydrogen peroxide light-activated bleaching kit, used for in-office bleaching procedures contains: (1) bleaching gel, (2) LiquiDam™, (3) vitamin E oil, (4) high suction tip, (5) face bib, (6) light guide extender, and (7) cotton rolls and gauze. ZOOM! Day White, a 9.5% hydrogen peroxide bleaching kit, which is intended for at-home dentist guided bleaching procedures. This kit uses an ethylene vinyl acetate sheet (5" × 5" × 0.40 inch). A power analysis was completed for a repeated measures analysis of variance. The computed effect size for the change in color (ΔE) was found to be 0.6, using an alpha (α) level of 5% and a beta (β) level of 20%, i.e., power = 80%. This study included six cases per cell for a total of 18 cases. To compensate for a drop-out rate of approximately 15%-20%, the required total sample size in this study will be 21 cases. A sample size calculation was performed using G*Power® Version 3.1.9.2. The study was approved by the ethical committee in Misr International University (MIU) before the clinical study was initiated. The ethical committee approval number is MIU-IRB-1516-013. All of the procedures were completed in the MIU dental outpatient clinic. Twenty-one participants were selected to conduct the study. The selection was based according to the following inclusion and exclusion criteria[11,12]. The patients included in the study should have generalized tooth staining, and be between the ages of 18-45 years (not younger than 18 years, in order to avoid expected hypersensitivity due to an immature pulp, and not older than 45 years due to inherent color of resistant dentin index). The subjects should also be available for the duration of the treatment and can attend all of the recall visits. The patients have all six maxillary anterior teeth (intact dentition), and tooth shades of A2 or darker. Patients were excluded from the study if they had any pathology (e.g., aggressive chronic periodontitis or temporomandibular joint disorders, etc.). They also should not be tobacco smokers, pregnant or lactating, have tetracycline resistant type stains, exposed roots, cracks or crazing present in the enamel or with excessive hypersensitivity of the teeth. Randomization was done using the "Toss method". All participants were divided into three equal groups, seven patients in each group according to the technique of bleaching system adopted: first group, in-office dental bleaching gel; second group: at-home bleaching gel; third group: combination of in-office and at-home bleaching techniques; according to the manufacturers’ instructions. Bleaching of the mandibular teeth was done for patient satisfaction, but not considered in the evaluation. For each selected patient, personal data, medical/dental histories were recorded, and a clinical dental examination was completed. Permission to carry out the study was obtained from the institutional ethics committee for research on human subjects. Volunteers were informed about the nature of the study, and a written consent was obtained from each patient. At the first visit, dental prophylaxis and oral hygiene measures were completed. After tooth scaling (Varios 350 Ultrasonic scaler, NSK), all of the patients were instructed to brush their teeth at least twice a day using a non-fluoridated non-whitening tooth paste. Impressions were taken using an alginate impression material (Tropicalgin, Zhermak, Germany) and poured using a dental stone. Two special trays were fabricated using ethylene-vinyl acetate and soft tray sheets (Soft-tray® 5" × 5" 2 mm thickness, Ultradent Products Inc, USA). One tray was used for the standardization of shade evaluation by measuring a 6-mm diameter circle, in the middle segment of the labial surface of the maxillary right central incisor, then an opening in the tray was made to guide the spectrophotometer tip. After the spacer was added on the labial surface of the anterior teeth (to allow room for the bleaching gel), the second tray was fabricated and trimmed 0.5 mm from the gingival margin. This space was used to receive either the at-home treatment or for the application of the desensitizing agent (Relief ACP Amorphous Calcium Phosphate, Phillips, USA) for the in-office group and the combined group. Patients of the combined group reused the tray after applying the desensitizing agent for at-home bleaching. Prior to the bleaching application, the color determination was completed using a VITA Easyshade® Compact (Vita Zahnfabrik, Bad Säckingen, Germany). Calibration of the VITA Easyshade® was done every time before shade determination[14,15]. The process of measurement was repeated three times to ensure accurate readings, avoid deviations, and an average reading was taken. First, vitamin E oil was applied to the patient’s lips, then the insertion of the IsoPrep Retractor was completed, and the face bib was placed, followed by a gauze and cotton roll placement for complete isolation. LiquiDam™ was then applied to the gingival sulcus to create a perfect seal. Light Curing (Dental Woodpecker LED Curing Light, Star Dent, China) of the LiquiDam™ was done for 10 s. Application of bleaching gel was completed, then the patient’s chair was reclined. Indenters present in the IsoPrep Retractors were aligned to receive the bleaching lamp (ZOOM! Whitespeed Power Pack, Whitening LED Accelerator, Philips). Participants were then subjected to three bleaching sessions; the timer was set for 15 min. When the session was over, the bleaching gel was removed with high volume suction and gauze. The bleaching gel was reapplied for each session. This process was then repeated for a third session. After termination of treatment, the bleaching gel was wiped off of the teeth, and then the teeth were washed thoroughly using an air-water tip and high-volume suction. Finally, the LiquiDam™ was removed. By the end of the three sessions, Relief ACP was placed in the special fabricated trays, and the subjects were instructed to wear the trays for 30 min. After finishing the bleaching sessions, the participants were given post-bleaching instructions; for the first 48 h, they were asked to refrain from any pigmented diet (such as a colored sauce, berries, ketchup) or beverages. Subjects were also asked not to use any chlorohexidine mouthwash as the mouthwash may stain the tooth. Participants were introduced to the bleaching regime and demonstrated how to use the treatment. For subjects who had undergone ZOOM! DayWhite bleaching, the patients were instructed to wear the bleaching trays according to manufacturer’s instructions by placing a tear-drop amount of the bleaching gel in the labial compartment of the tray. After placing the tray inside the mouth, any excess material was removed using cotton. Finally, after removal of the tray, the teeth were rinsed and brushed to remove excess gel. The bleaching process was done two times a day for 0.5 h for 14 consecutive days. For subjects who had undergone the combined treatment, they were subjected to two "15-min" in-office ZOOM! bleaching sessions, and then the next day they were instructed to use ZOOM! Day White home bleaching systems twice daily, 30 min each session for another 14 consecutive days[7,10]. A color evaluation was completed at one day, one week, one month and six months after termination of the treatment. Patients were called back for four visits, where shade was reevaluated; patients were asked to wear the special trays, then the Easyshade® spectrophotometer tip was guided through the window opening in the tray. Shades were then recorded, tabulated, and saved for further results. Tooth shade was measured according to CIELAB where L* is the degree of lightness, a* green to red, and b* is blue to yellow. The total color difference (∆E) was calculated using the formula: ∆E = [(∆L*)2 + (∆a*)2 + (∆b*)2]1/2. Using a visual analog scale (VAS), qualitative values were recorded such as; no pain, mild, moderate, and severe pain. Hypersensitivity was measured at the baseline, 24 h, 48 h, and 1 week after treatment. Measurement of hypersensitivity was subjective; patients were asked to rate the hypersensitivity according to the degree of sensitivity. The recorded data were collected, tabulated, and statistically analyzed. Statistical analysis was performed with the IBM® SPSS® Statistics Version 20 for Windows. Numerical data were explored for normality by checking the distribution of data and using tests of normality (Kolmogorov-Smirnov and Shapiro-Wilk tests) where the significance level was set at P ≤ 0.05. The VAS scores data showed non-parametric (non-normal) distribution. The data were presented as mean, median, standard deviation (SD), minimum, maximum, and 95% confidence interval (CI) for the mean values. For non-parametric data, the Kruskal-Wallis test was used to compare the three bleaching techniques. A Friedman’s test was used to study the effect of time. A Dunn’s test was used for pair-wise comparisons when Kruskal-Wallis or Friedman’s test is significant. Qualitative data were presented as frequencies and percentages. Fisher’s Exact test was used to compare the techniques. Friedman’s test was used to study the effect of time. Statistical analysis of the obtained results are presented in the Tables 2 and 3 and illustrated in Figures 1 and 2 for testing ∆E change in color in terms of color stability. Tables 4 and 5 and Figures 3 and 4 represent the statistical analysis for testing hypersensitivity after bleaching (VAS). In the current study, there was not a statistically significant difference between the mean values and SD (ΔL) of the three bleaching techniques after 1 day, 1 week, as well as 1 month [Table 2]. After 6 months, in-office bleaching showed the statistically significant highest mean and SD = 5.59 ± 4.06. In-home bleaching showed a statistically significant lower mean value and SD = 1.51 ± 2.31. Combined treatment showed the statistically significant lowest mean value and SD = -1.09 ± 3.56 (ΔL), where the P-value was 0.022 at the 6 months follow-up period between groups, and the significant level is P ≤ 0.05. In Table 3, the Friedman’s test was completed to show the descriptive statistics and test the effect of the different bleaching techniques on the color change (∆L) over time in the three different groups. In the in-office, at-home, or combined bleaching techniques, there was not a statistically significant change in the mean (ΔL) at the different follow-up periods, where the P-value > 0.05 in all the groups. In the current study, Table 4 and Figure 1 are showing that there is not a statistically significant difference between the mean (ΔE) of the three bleaching techniques at different follow-up periods of 1 day, 1 week, 1 month as well as 6 months after treatment. The P-value was 0.597, 0.219, 0.825, and 0.262 respectively. The results of the current study are presented in Table 5 and Figure 2, demonstrating that the in-office, at-home, or combined bleaching techniques that there was not a statistically significant change in mean (ΔE) at the different follow-up periods, where the P-value ≤ 0.05. Data in Table 3 mean value of ∆E represents the effect of time intervals among each bleaching technique. There was not a statistically significant difference between D1, W1, M1, and M6 among each bleaching group; in-office, at-home, and combined, where the P-value was 0.618, 0.459 and 0.867 respectively. All of the bleaching techniques, through all follow-up periods, showed no statistically significant difference between the different bleaching techniques in terms of percentage value of hypersensitivity. Table 6 and Figure 3 compared the hypersensitivity recorded between the different tested bleaching techniques with a P-value of 0.115, 1.00 and 1.00 respectively. However, it is worth mentioning that in case of in-office bleaching, immediately after termination of bleaching session, all of the patients showed some hypersensitivity ranging from mild to severe. Table 7 and Figure 4 compared the hypersensitivity recorded in each bleaching treatment throughout the follow-up periods; it was found that with in-office bleaching technique; there was a statistically significant change by time. There was an increase in the prevalence of cases with no hypersensitivity at day 1, day 2, and day 7. There was an increase in the prevalence of mild hypersensitivity at day 1 followed by a decrease at day 2. The prevalence of moderate hypersensitivity did not change from immediately after bleaching to day 1 but disappeared at day 2. Cases with a severe degree of hypersensitivity were found immediately after bleaching but disappeared at day 1. All cases showed no hypersensitivity at day 7 after treatment is completed. While the in-home bleaching, as well as the combined technique, there was a statistically significant change per time. Prevalence of cases without hypersensitivity did not change from immediately after bleaching to day 1, then increases from day 1 to day 2, and day 2 to day 7. 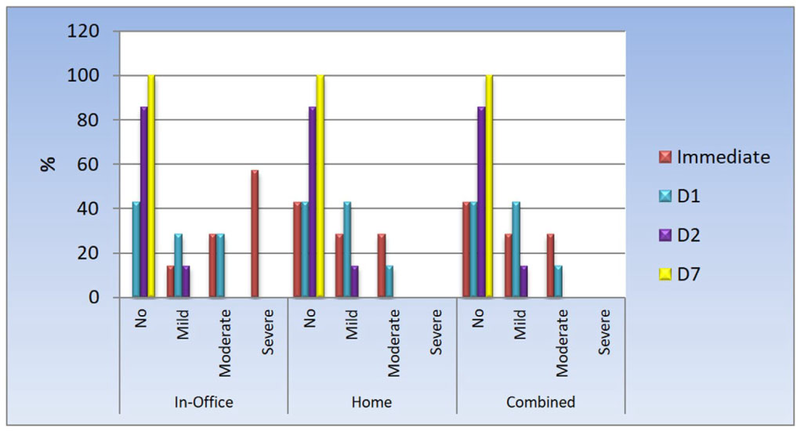 There was an increase in the prevalence of mild hypersensitivity at day 1 followed by a decrease at day 2. There was a decrease in the prevalence of moderate hypersensitivity at day 1, and it disappeared at day 2. All of the cases did not show hypersensitivity at day 7. Effect of hypersensitivity has faded in all groups over time where the P-value was < 0.001, 0.009 and 0.009 respectively. The study failed to reject the null hypothesis as it was found that there was not a difference between the in-office, the at-home, or the combined bleaching techniques. This was true for both color stability and hypersensitivity. In the current study, the in-office bleaching technique showed a statistically significant change in lightness (∆L) compared to both at-home and combined techniques after the 6-month follow-up, potentially indicating more resistance to color relapse [Table 2]. However, this was not reflected in the overall color change (∆E) [Table 4]. The tested in-office bleaching system was a light activated system using the LED as a bleaching accelerator. It has been stated that the LED is the most favorable light source as it emits blue light with high energy that stimulates the breakdown of hydrogen peroxide without heat production. The only disadvantage is the high cost of the light. With the help of the LED and the presence of ferrous gluconate as a photo initiator as an ingredient in the bleaching gel, it accelerates the process of breakdown of hydrogen peroxide in the presence of light. Blue light of ZOOM! does not produce heat. The metallic salts present as a main ingredient in the bleaching gel increases the breakdown of hydrogen ions to OH ions and radicals due to the Fenton reaction. This reaction leads to the breakdown of stains. ZOOM! advanced light works by breaking the conjugated double carbon bond C=C into C-C single-bonded molecules thus increasing the photochemical reaction rate. Other components are added such as poloxamer, a thickening agent which increases the oxygen releasing time up to four times, glycerin which is a carrier that maintains moisture in gel and helps dissolve the components. All these reasons might have been reflected on longer maintenance of a lighter shade at the 6-month follow-up. The results of the current study revealed that after bleaching, all groups showed a mean color difference (∆E) which was above the clinically perceptible range (∆E > 3.3). These results are similar to a study conducted by Bizhag et al. who compared the effect of in-office bleaching treatment and at-home bleaching, and found an average change in delta E of 3.58 and 5.7. These results were also in agreement with da Costa et al. who compared the effect of at-home and in-office bleaching treatments and found that there was a statistically significant change in ∆E = 6.6 with the in-office bleaching treatment. When comparing the three systems, the results of the current study showed no statistically significant difference between the different bleaching techniques concerning the overall color change (∆E) in all tested periods. These results were consistent with Machado et al., Bizhag et al., Rezende et al., Dawson et al., and Basting et al.. It has been assumed that the higher hydrogen peroxide concentration would give better results. However, the short exposure time to a high concentration can be compensated by less concentration of hydrogen peroxide and longer exposure time[5,9,21]. When comparing the time of assessment, no significant difference in color change was found in all of the groups. The results go well with Tay et al., da Costa et al., and Rezende et al.. The current results were in disagreement with Bizhag et al. who found that there was a significant difference in shade change, while there was no significant difference in ∆b, change in ∆L were greater in at-home bleaching in comparison to in-office bleaching in a follow-up period of three months. Considering that Bizhag et al. used 15% hydrogen peroxide for in-office bleaching, and evaluated the shade immediately after bleaching and 3 months after; dehydration after bleaching might have led to a drastic change in color; thus immediate shade evaluation might lead to significant shade change in the follow-up period. The results of the present study were also opposing those of Dawson et al. and Deliperi et al. who both found that there was a significant change in shade from baseline evaluation to the 1 week follow-up period. Dawson et al. and Deliperi et al. both evaluated shade immediately after in-office bleaching treatment which might be affected by tooth dehydration after bleaching. This change in shade can be due to the high concentration of hydrogen peroxide used and due to the dehydration, the immediate shade evaluation that might have caused this significant change in extrinsic stains. Previous studies have not compared hypersensitivity accompanying the three tested bleaching techniques. However, the results of the current study revealed, that although statistically insignificant, in-office bleaching showed the highest degree of hypersensitivity where four patients (57%) experienced severe sensitivity immediately after treatment in comparison to home and combined treatment. This result is in agreement with Machado et al., Tay et al., Berga-Caballero et al., and Rezende et al.. It has been suggested that tooth sensitivity was due to high peroxide concentrations and due to the acidic pH of bleaching gel which can lead to a surface roughness of sound enamel surface. Also, the presence of nascent oxygen free radicals, which is the by-product of hydrogen peroxide breakdown, can enter in the dentinal tubules reaching the pulp causing fluid movement. This movement can lead to sensitivity. Therefore, the tested in-office bleaching kits are accompanied by relief ACP amorphous calcium phosphate as a desensitizing agent to be applied using a tray after termination of bleaching agent. Relief ACP is an amorphous calcium phosphate containing agent, used to decrease both sensitivity and the degree of demineralization through the remineralization process that might occur after the bleaching treatment. Along with other ingredients as potassium nitrate that works by decreasing nerve excitability by depolarizing the nerves thus preventing nerve impulses from reaching the brain, also, sodium fluoride and sodium phosphate, they decrease sensitivity by occluding the dentinal tubules thus preventing the dissolution of calcium and phosphate ions thus decreasing the dentin permeability. However, it is worth mentioning, that two patients withdrew from the study before finishing the in-office bleaching sessions owing to severe hypersensitivity which lead to termination of treatment. The results of the current study disagreed with Basting et al. who conducted a study comparing two different concentrations of hydrogen peroxide and two concentrations of carbamide peroxide. Basting et al. found that 20% carbamide peroxide showed more hypersensitivity than 35% hydrogen peroxide, and suggested that sensitivity may not only be related to the peroxide concentration but most likely is related to the time and length of application in contact with the tooth[13,24]. The results of the present study found that there was not a statistically significant difference between at-home and the combined treatment regarding hypersensitivity. These results are similar to a study conducted by Dawson et al.. In the current study, the tested at-home bleaching gel contains potassium nitrate and sodium fluoride, which are considered desensitizing agents, reduces the postoperative sensitivity. The current study showed that for all of the tested bleaching techniques, hypersensitivity disappeared completely for all of the subjects by the end of the seven days follow-up. This finding is in agreement with da Costa et al. and Martin et al.. It has also been suggested that the darker the teeth, the increased risk of hypersensitivity. Darker teeth have a higher amount of organic content which retains the hydrogen peroxide in the enamel and dentin. It has been stated that the post-bleaching hypersensitivity can be dependent on the hydrogen peroxide concentration which leads to more dentin and enamel permeability[7,22]. This permeability can explain the immediate hypersensitivity with in-office bleaching. However, in the current study, there was not a significant difference between the groups of different concentrations. The low concentration is compensated by the longer exposure time with the at-home bleaching treatment which leads to similar degrees of sensitivity. Dentin hypersensitivity can also be a subjective result and can differ from one patient to another, leading to personal variability. The variability is dependent on many factors such as pain threshold, age, enamel and dentin thickness, the variation of diffusivity of the bleaching agent, and PH[20,22,24]. The fact that the dentin hypersensitivity completely disappeared after the seventh day in all of the tested groups, minimizing the restrictions during the selection of material for the patient. This selection depends on many factors such as the patient’s needs, compliance, and time available for treatment. However, it is worth mentioning that by increasing the sample size, this might give better results. The sample size calculation was done using a power test. Also, this study was done using only one concentration of each bleaching agent which may be considered a limitation. As a recommendation for further studies, comparing the efficiency of different bleaching materials from different companies may be needed for generalization of the finding. Also, different methods to decrease post bleaching hypersensitivity should be tested. In conclusion, within the limitations of the current study, the following conclusions were found: (1) the different tested bleaching techniques showed similar clinical efficiency; (2) in a follow-up period of 6 months, the different tested techniques showed equal color stability; (3) the different tested bleaching techniques presented a similar degree of hypersensitivity; and (4) all of the tested bleaching techniques noted that the hypersensitivity diminished at the 7 days follow-up. I would like to acknowledge the efforts of Dr. Jon Wagner in refining the final manuscript. Data were obtained from MIU database computer systems. Volunteers were informed by nature of the study and a written consent was obtained from each patient before treatment. The study obtained approval from the ethical committee in Misr International University (MIU) prior to the clinical study, with an ethical committee approval number (MIU-IRB-1516-013). 1. Matis BA, Wang G, Matis JI, Cook NB, Eckert GJ. White diet: is it necessary during tooth whitening? Oper Dent 2015;40:235-40. 2. Wray A, Welbury R; Faculty of Dental Surgery, Royal College of Surgeons. Treatment of intrinsic discoloration in permanent anterior teeth in children and adolescence. Int J Paediatr Dent 2001;11:309-15. 3. Croll TP. Enamel microabrasion for removal of superficial demineralization and decalcification defects. J Am Dent Assoc 1990;120:411-5. 4. Kawamoto K. Effects of the hydroxyl radical and hydrogen peroxide on tooth bleaching. J Endod 2004;30:45-50. 5. Berga-Caballero A, Forner-Navarro L, Amengual-Lorenzo J. At-home vital bleaching: a comparison of hydrogen peroxide and carbamide peroxide treatments. Med Oral Patol Oral Cir Bucal 2005;11:E94-9. 6. Marson FC, Sensi LG, Vieira LC, Araújo E. Clinical evaluation of in-office dental bleaching treatments with and without the use of light-activation sources. Oper Dent 2008;33:15-22. 7. Machado C, Santos A, Pinherio F, Cunha A, Vasconcelos A, Borges B. 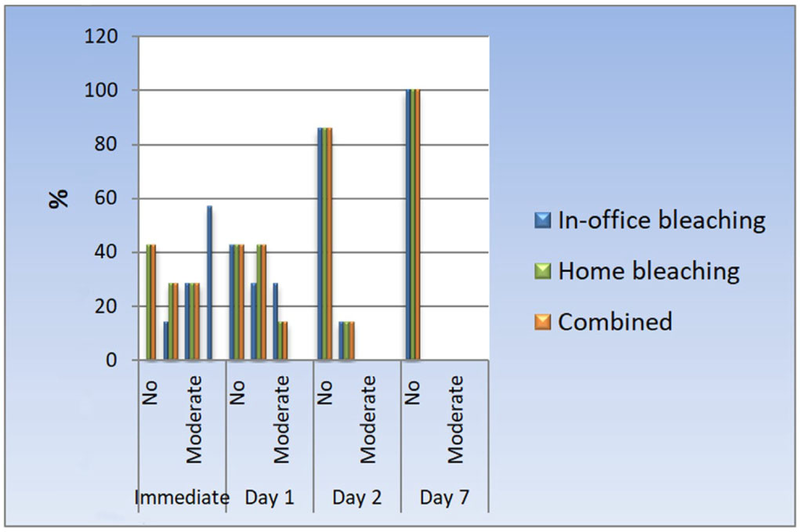 Comparison of the clinical efficacy of at-home and in-office bleaching. Int J Dent Clin 2011;3:1-4. 8. Radz G. Effectiveness of a combined in-office and take-home whitening system for teeth shades A3.5-A4. Compend Contin Educ Dent 2014;35:696-701. 9. Ontiverous JC, Kugel G. In-office whitening treatment. Inside Dent 2014;10:88-92. 10. Deliperi S, Bardwell DN, Papathanasiou A. Clinical evaluation of a combined in-office and take-home bleaching system. J Am Dent Assoc 2004;135:628-34. 11. Matis BA, Cochrane MA, Wang G, Eckert GJ. A clinical evaluation of two in-office bleaching regimens with and without tray bleaching. Oper Dent 2009;34:142-9. 12. da Costa JB, McPharlin R, Paravina RD, Ferracane JL. Comparison of at-home and in-office tooth whitening using a novel shade guide. Oper Dent 2010;35:381-8. 13. Suliman M, Addy M, Macdonald E, Rees JS. A safety study in vitro for the effects of an in-office bleaching system on the integrity of enamel and dentin. J Dent 2004;32:581-90. 14. Elamin H, Aboubakr N, Ibrahim Y. Identifying the tooth shade in group of patients using vita easy shade. Eur J Dent 2015;9:213-7. 15. Khashayar G, Dozic A, Kleverlaan C, Feilzer A. Data comparison between two dental Spectrophotometer. Oper Dent 2012;37:12-20. 16. Alqahtani MQ. Tooth bleaching procedures and their controversial effects: a literature review. Saudi Dent J 2014;26:33-46. 17. Bizhag M, Chun Y, Damerau K, Singh P, Raab W, Zimmer S. Comparative clinical study of the effectiveness of three different bleaching methods. Oper Dent 2009;34:635-41. 18. Rezende M, Ferri L, Kosstaz S, Loguerico A, Reis A. Combined bleaching technique using low and high hydrogen peroxide in-office bleaching gel. Oper Dent 2016;41:1-9. 19. Dawson P, Sharif M, Smith A, Brunton P. A clinical study comparing the efficacy and sensitivity of home vs combined whitening. Oper Dent 2011;36:460-6. 20. Basting RT, Amaral F, Franca F, Florio F. Clinical comparative study of the effectiveness of and tooth sensitivity to 10% and 20% carbamide peroxide home use and 35% and 38% hydrogen peroxide in-office bleaching materials containing desensitizing agents. Oper Dent 2012;37:464-73. 21. Auschill T, Savia T, Hellwig E, Arweiler N. Randomized clinical trial of the efficacy, tolerability, and long term color stability of two bleaching techniques: 18-months follow-up. Quintessence Int 2012;43:683-93. 22. Tay L, Kose C, Herrera R, Reis A, Lougercio A. Long term efficacy of in-office and at-home bleaching: a 2-year double-blind randomized clinical trial. Am J Dent 2012;25:199-204. 23. Bernardon J, Sartori N, Ballarin A, Perdigão J, Lopes C, Baratieri N. Clinical performance of vital bleaching techniques. Oper Dent 2010;35:3-10. 24. Bonnie J, Dip D, Supeene L. Tooth whitening: efficacy, effects and biological safety. Probe Sci J 1999;33:169-74. 25. Martin J, Fernandez E, Bahamondes V, Werner A, Elphick K, Oliveria O, Moncada G. Dentin hypersensitivity after bleaching with in-office systems. Randomized clinical trial. Am J Dent 2013;26:10-4.